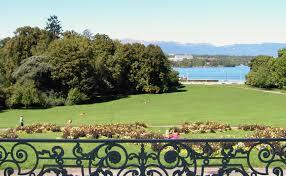 The beautiful city of Geneva is located at the southern tip of Lake Geneva. It sits in a majestic setting surrounded by the Alps and Jura Mountains. From the city there are dramatic views of Mont Blanc. You’ll find the headquarters of Europe’s United Nations and the Red Cross here. 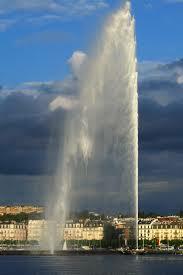 A well-known landmark in Geneva is its pencil fountain The Jet d’Eau. This fascinating lakeside fountain is the first thing you’ll see as your plane gets ready to land. The structure is 140m tall and shoots out water with a force of 200km/h, 1360 horsepower. It creates a sky-high jet of water which sparkles in rainbow colors on sunny days. It is most refreshing in the summertime as at any one time 7 tonnes of water are in the air and then spray on people down on the pier. 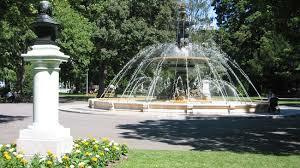 At two or three times a year the fountain lets illuminated pink, blue or another color to make a humanitarian event. Mostly Gothic St. Pierre Cathedral was begun in the 11th century. 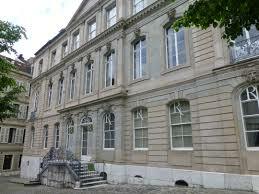 It has an 18th century neo-Classical facade. Protestant John Calvin preached here between 1536 and 1564. You can see his seat in the north aisle. Inside there are 77 steps spiraling up to the attic afterwards another 40 steps lead up to the panoramic northern and southern towers for awesome views all around. In the summer free Carillion and organ concerts are held in the cathedral filling the surrounding square with music. The cathedral is located in the interesting Old Town, where at No. 40 you’ll find the house where Espace Rousseau the 18th century philosopher was born. Beneath the cathedral you’ll find the archaeological site with fine 4th century mosaics and a 5th century baptismal font. Of interest is The Art and History Museum with more than 7,000 exhibits on display. They range from prehistoric finds to modern paintings. 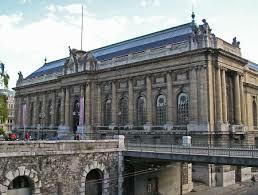 The museum opened its doors in 1910 and is the largest museum in Geneva. The Department of Applied Arts displays Byzantine Art, icons, musical instruments and textiles. In the sector which is devoted to Fine Arts you’ll find paintings that range from the Middle Ages to the 20th century. 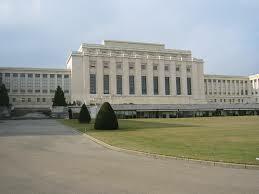 The home to the UN has been here since 1966 housed in the Palais des Nations. It was built between 1929 and 1936. Visits here are by guided tour only wit ID card or passport. The tour is an hour long and includes a tour of the building and the surrounding 46-hectare park. The park has lovely old trees and peacocks. You’ll also see the grey monument sealed with heat-resistant titanium that was donated by the USSR in order to commemorate the conquest of space. Take a wonderful stroll on the picturesque northern lake shore promenade – Quai-du-Mount-Blanc. Here you’ll find beautiful flowers, statues, outdoor art exhibits and fantastic views of Mount Blanc on clear days. The promenade will lead you to several city parks. The International Museum of the Reformation is housed in an 18th century mansion. 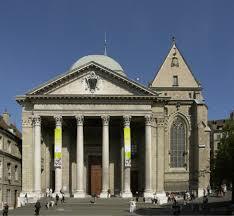 There are state-of-the-art exhibits and audiovisuals about everything from the earliest Bibles to the time Geneva emerged as “Protestant Rome” in the 16th century. It covers it all from John Calvin all the way up to Protestantism in the 21st century. A most lovely place is the English Garden. 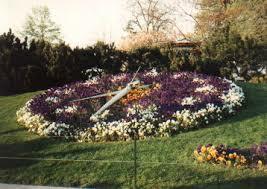 It has a large flower clock which is a most popular photo spot. This waterfront garden was landscaped in 1854 on the site of an old lumber-handling port and merchant yard. The flower clock is known as The Horloge Fleurie and is created from 6,500 plants. It has been in the garden since 1955. Its second hand which is 2.5m long is thought to be the world’s longest. 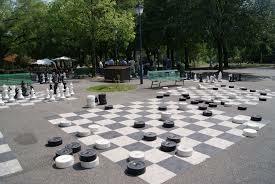 A fascinating park full of statues and a giant chess board is Park des Bastions. Here you can see a statue of the cofounder of the Red Cross Henri Dufour. He also drew the first map of Switzerland in 1865. There are 4.5m tall statues of Beze, Calvin, Farel and Knox. 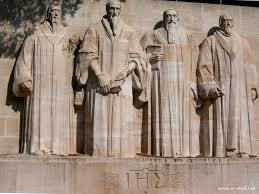 The official commemoration of Geneva’s significant role in the Reformation is the Reformation Wall or Reformation Monument. It was carved in the early 20th century and construction took from 1909 to 1917. The giant wall is 325 feet long and 30 feet high. The wall dominates the Parc de Bastions and centers on 15ft. 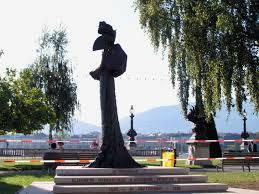 tall statues of four Geneva luminaries. 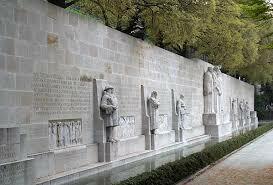 Behind the statues is the motto shared by the Reformation and Geneva – Post Tenebras Lux “After Darkness, Light”. 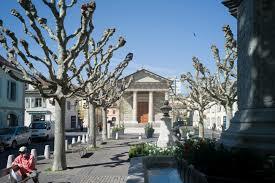 Surrounding the four Genevan reformers are smaller statues of major Protestant figures, bas-reliefs and inscriptions. One relief depicts Roger Williams and the Pilgrim Fathers praying on the deck of the Mayflower. Another shows the Bill of Rights being presented to King William of Orange by the English Parliament in 1689. At the sides of the wall you’ll find Martin Luther – the German “Father of the Reformation” and Ulrich Zwingli – a Swiss reformer based in Zurich. A lovely rose garden is Parc de la Grange which has one rosebush per square meter and altogether the garden is 12,000 square meters. 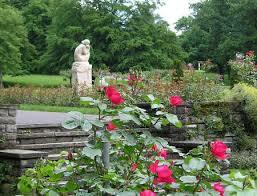 It was created from 1945 to 1946 and has over 200 different varieties of roses. The flowerbeds are in terrace form between large stairways created from natural rock and enhanced by pools and pergolas (shaded walkways). 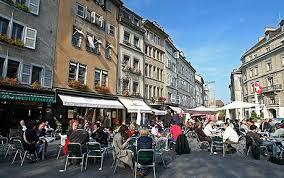 Geneva’s answer to New York City’s Greenwich Village is its Bohemian district Carouge. Just a short distance from the city center you’ll find yourself surrounded by architecture that reminds of Sardinia and you’ll feel like you’re in Southern Europe. There are many interesting shops, shady terraces, crafts and antique dealers in its alleys and passageways. Take the time to explore its nightlife in the many trendy and popular bars here. Thank you glad you enjoyed the tour of Geneva. Extremely beautiful. Thank you for making me visit this beautiful city while in my office. You welcome Ngobesing. That was my purpose for starting these armchair travels so that everyone can get to know about great cities through writing and photos if they cannot travel to there. Glad I could give you a tour of Geneva. You have a great vision. We can relate and fall in love with other places sitting in our bed rooms through work like yours. Well done!